Being an avid fan of anything, be it a film, a band, or an author’s work, comes at a price; a gnawing hunger to consume our drug regardless of the social, mental, and financial toll it might take. Aside from that overwhelming desire there is also a parallel drive to feel something new for a work that we have poured our heads and hearts wholeheartedly into. This soon breeds insular personalities who operate in a fantasy world where in our mind’s eye we hear Philip Glass's score from the Qatsi trilogy being played as we engage in the most banal of rituals like writing an e-mail or waiting for the bus. For agoraphobic Chun Soo-roo (Ko Hyeon-jeong) her world is the heightened reality of the crime genre. A dual world of cops and robbers, heists, capers, and double and triple crosses, where money switches hands faster than henchmen switch sides. A farewell goodbye to a friend at the airport becomes the elaborate setup for a great story. However menacing serial killers and rabid gangsters do not populate these dark alleyways. 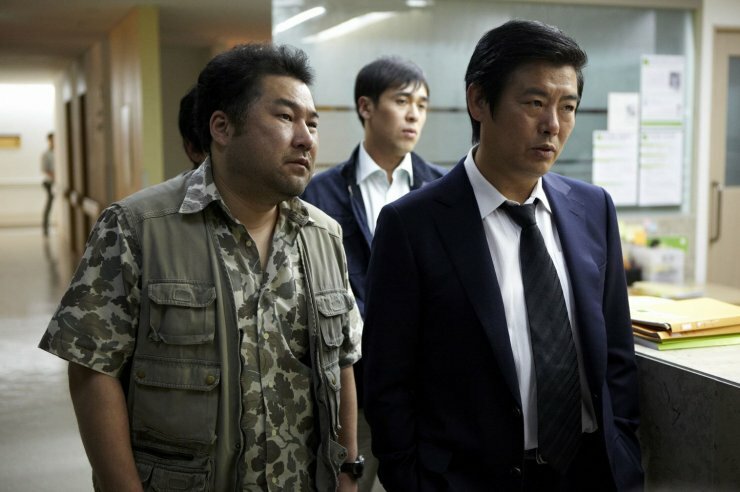 Instead, director Park Chul-kwan borrows more from Ocean's Eleven (The original Sinatra version as well as the Soderbergh remakes) and Catch Me If You Can (2002) than from gritty crime dramas like The Yellow Sea (2010) or Nameless Gangster (2012). From the inspired faux-retro Saul Bass-inspired title sequences to the klezmer heavy score Miss Conspirator (2012) is a movie built firmly on the clichés of suspense pictures. Of course as any student of the genre knows there is no better master of suspense then Alfred Hitchcock, who invented the grammar of suspense for film. Now of all the “rules” that Hitchcock establishes the one main tenet that is the trickiest one to master is that of the MacGuffin, ultimately a made up name for the thing that drives heroes and villains to risk life and limb to obtain in the film. It can be a briefcase filled with money, government secrets, or a lost love. It doesn’t really matter because the MacGuffin is just a small detail that gives filmmakers an excuse to tell their story. In Miss Conspirator the prize is that great mainstay of all crooked cop dramas, money and drugs. What makes the film a good example of South Korea’s expertise in genre cinema is its style and characterizations. Chun Soo-roo starts the movie out as an anxiety ridden woman who suffers from survival guilt after a horrible boating accident left her parentless and alone in the world save for her roommate and friend who sadly must leave Soo-roo for a job in Japan at the start of the film. Though there are a lot of broad comedy gags where Soo-roo passes out, hyperventilates into a bag, or sobs uncontrollably to make us aware of her condition. What really communicates perfectly to us that Soo-roo is a fragile bundle of nerves is the subtle way Ko Hyeon-jeong is always performing as a woman perpetually in the fetal position even when standing up. Watching the film you get the sense that Soo-roo is both scared and waiting for an adventure to happen. It’s this tension that makes the film interesting. And to the director’s credit we don’t really have to wait long for the action to begin. Plot details and keeping score of all the various players is made easy by the fact that everyone in the film is a caricature of a familiar crime genre archetype. The corrupt cop, the hotheaded gang boss, the cold gangster turned businessman, and finally the suave lone wolf played by Yoo Hae-jin. The film doesn’t delve at all into their backstory or emotional motivation but we know what makes them tick and can predict with almost pinpoint accuracy what they will do before it happens on screen. Now for many this predictability and lack of “originality” may be a turn off and drive many people away from the film, but I saw the film as a stylistic exercise, playing within the safe boundaries of the genre and laughing at how contrived it all really is. It's interesting to note that if Park Chul-kwan was merely a lazy or bad director the film would be visually and narratively boring, hitting the circumscribed plot points like some amateur chef cooking his first dish but what we get is a combo platter of familiar flavors. It fills that empty void just enough for us to continue our search for far more substantial meals. Reading the idea behind this film I'm intrigued, will be adding this to my to watch list!